Christina Stavros, who participated in a pilot version of the Byzantine Music program this year at Holy Cross, helps lead the HCHC Women’s Byzantine Choir during a recent recording session. Holy Cross Greek Orthodox School of Theology is now offering a program of musical studies, available for all levels from beginner to advanced, that leads to a Certificate in Byzantine Music. Through this program, students will develop a mastery of the skills required for chanting the sacred hymns of the Church. The program will provide knowledge of the Byzantine psaltic notation and the theoretical framework of the Church’s musical modes. Students will learn to sight-read musical scores at all levels of complexity and gain an extensive familiarity with the contents and usage of liturgical books and the rubrics of the Orthodox Church. Upon completion of the program, students will be able to perform all musical parts of the daily liturgical cycle and the sacraments of the Church. 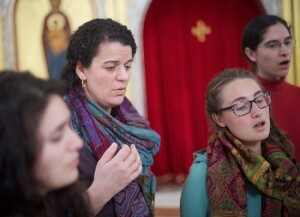 The Certificate in Byzantine Music reflects Holy Cross’s objective to serve the pastoral and liturgical needs of the Orthodox Church in this country and abroad. With its daily services and supportive community, the school is the ideal setting for an in-depth study of the sacred art of chanting and the formation of well-trained cantors. Individuals with a passion for Byzantine music who are not pursuing a theological degree at Holy Cross are also welcome to enroll in the program. Advanced cantors can also apply to test directly for certification. For more information, please contact Prof. Grammenos Karanos at gkaranos@hchc.edu or 617-850-1236.